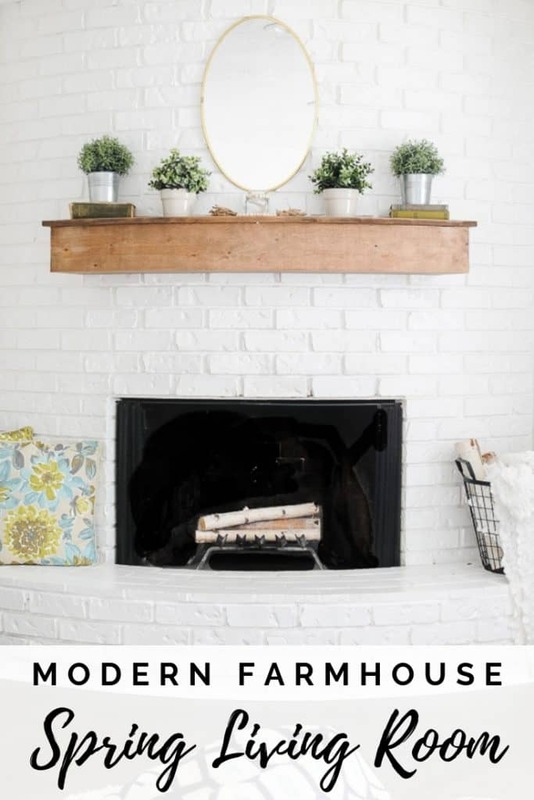 Come take a tour of our modern farmhouse spring living room! 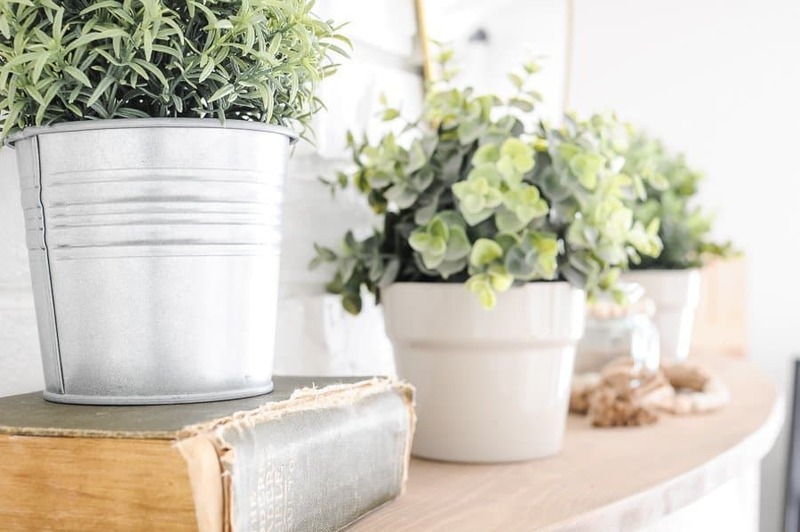 Use my decor to get ideas and inspiration for decorating your own living room for spring. 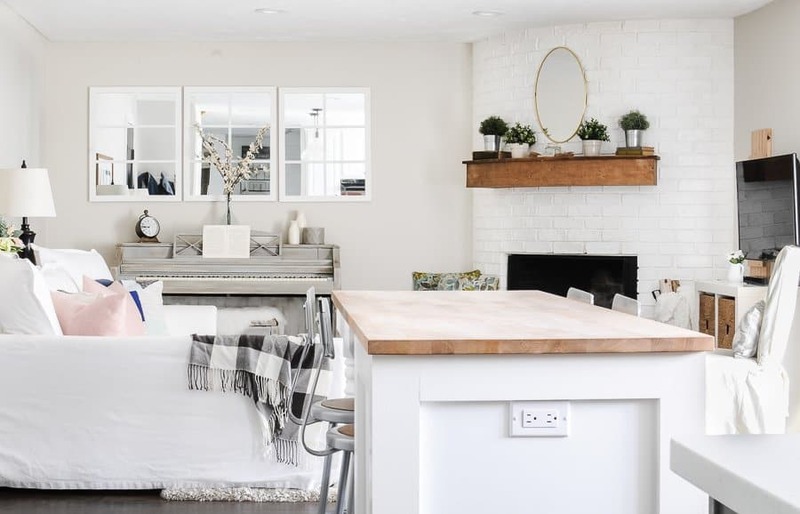 I hope you enjoy this tour of our modern farmhouse living room all decked out for spring-time! I’ve sourced everything I can at the bottom of the post, so be sure to check there if you’re wanting to grab something I’ve used. If you’re new to our home, welcome! We live in a 1400 sq/ft ranch-style home on half an acre and have been transforming the house into our home for about 3 years now. Our living room is located on the back of the house behind the garage. It works hard for us, considering it’s where our TV, fireplace, backyard entry and garage entry are all located. I love how functional it is without being huge. It’s probably only about 15′ by 20′ in size, but we’ve worked hard to make it seat as many people as possible while still feeling cozy. To the left of this view is our garage entry and to the right is our sliding door to the backyard. 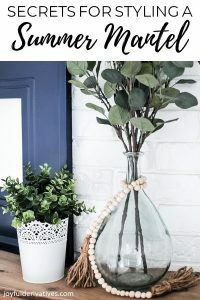 For our spring decor, I chose to add blues, greens and pinks as well as lots of florals and greenery. 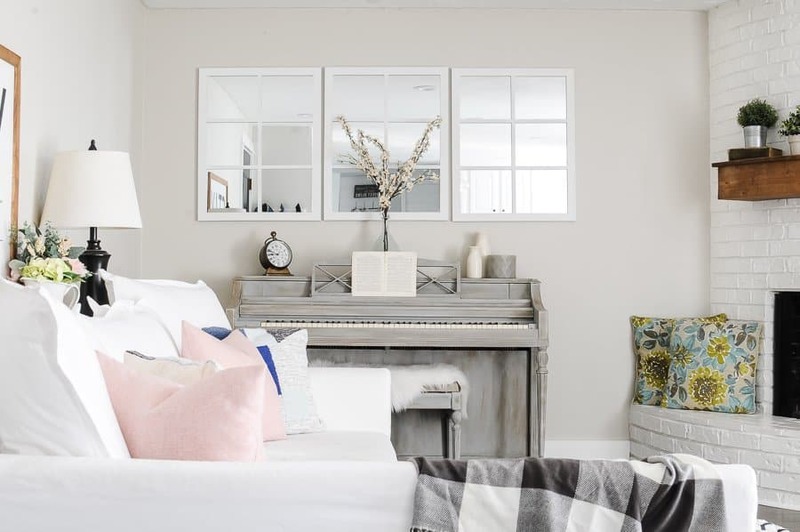 Not only do we have a small living room, but we also don’t have a guest room, so this small-scale sectional from IKEA has been perfect for our space! 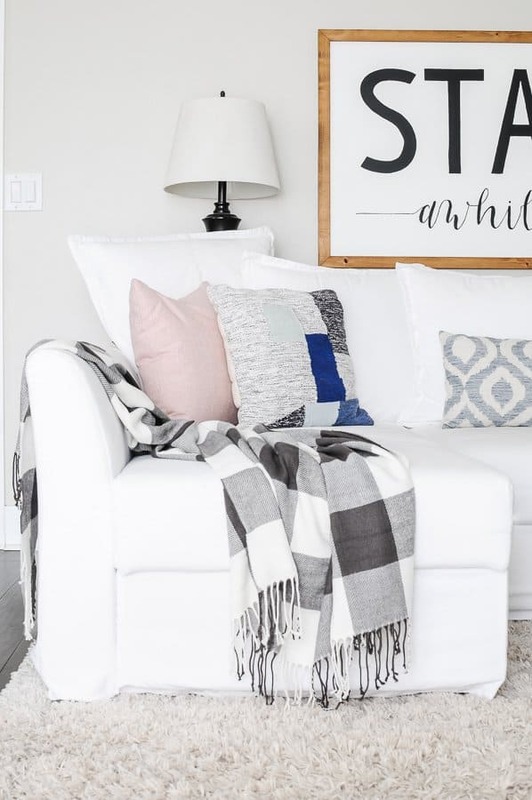 Not only does it pull out into a full-size bed for guests, but the white slipcovers are super easy to pull off and bleach whenever spills occur. 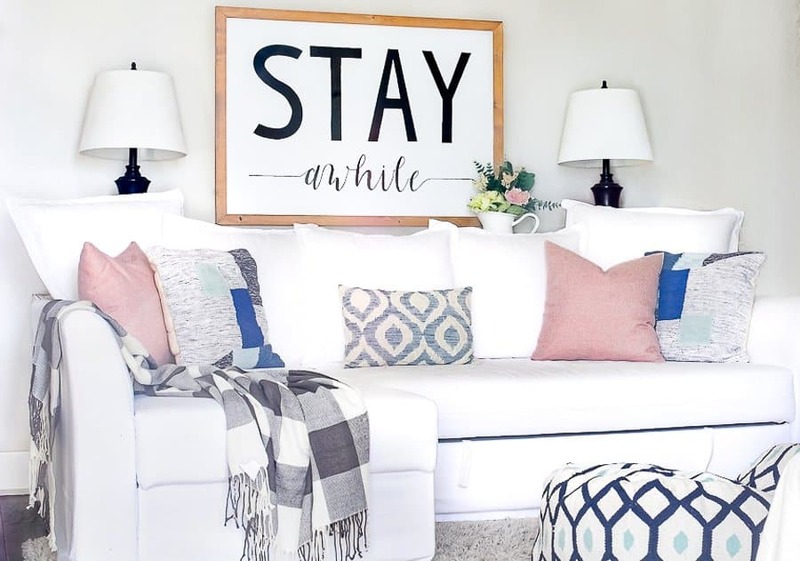 We moved our “Stay Awhile” sign from the dining room to above our couch at Christmas and I just can’t bring myself to move it back. I love how it fills the large wall behind the couch! You may notice, I always put floor pillows or poufs on the rug since we don’t have a coffee table. Our geometric floor poufs also add a bit more blue to the space! As you can see, we have a very unique fireplace that’s rounded in the corner. 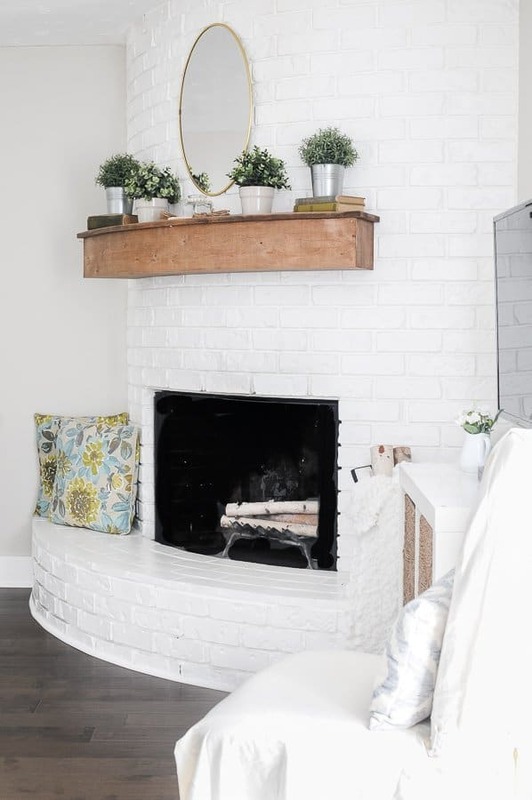 My husband, Chris, built the floating wood mantel to give us a place for decor. Love that man! I decided to go symmetrical on the mantel this time which is very rare for me! 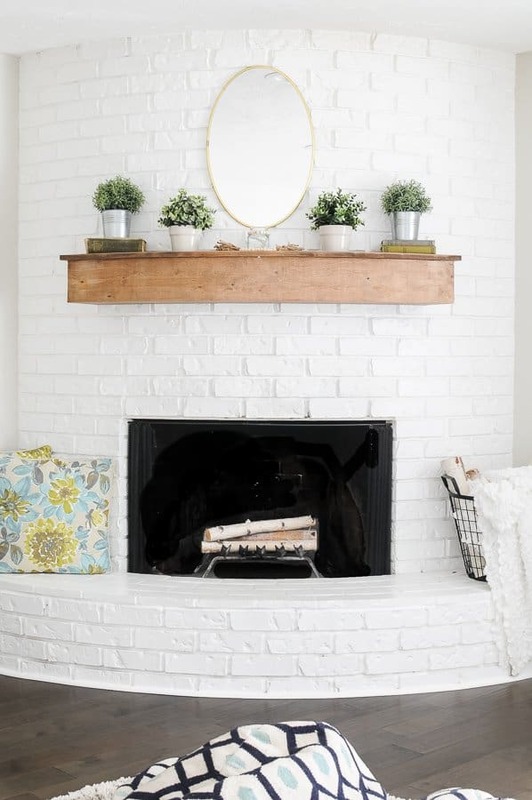 I also tossed a few floral throw pillows and a white throw on the hearth to add softness. The greenery plants are all from IKEA (as well as all their pots) and I made the wooden bead garland. It took me awhile to decide what I wanted under the gold mirror, and when I found this small blue glass jar in my candle closet I knew it would be perfect! 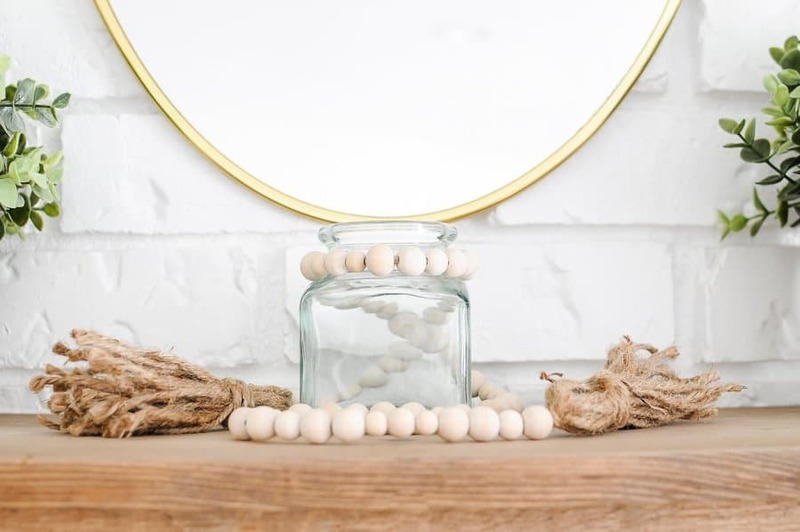 I’ve realized, this wood bead garland always makes an appearance on my spring mantel. It’s the perfect way to add interest to an otherwise simple piece. Our piano came from my step-dad’s family and we are the fourth generation to have it. It was originally a dark stained wood, so to make it match our lighter, brighter decor style, we had it refinished with chalk paint. 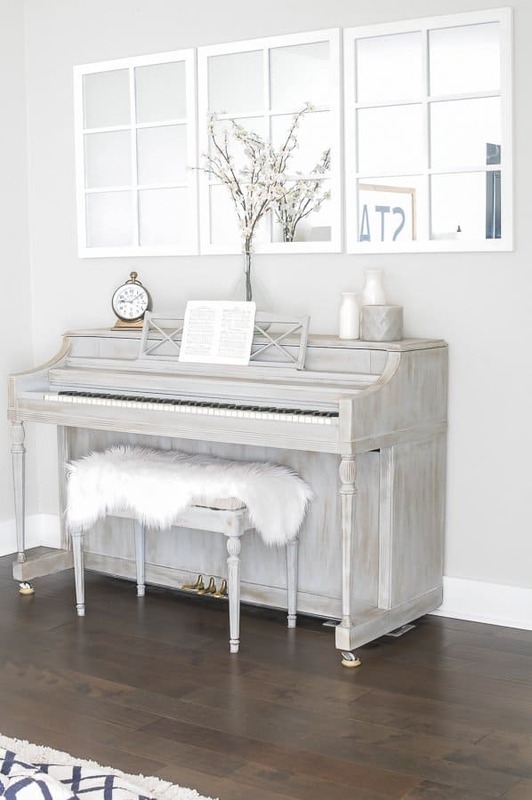 You’d be amazed by how many times I get asked for the painting method on this piano. Unfortunately, I had a professional painter refinish it for me, so I have no idea what they used! 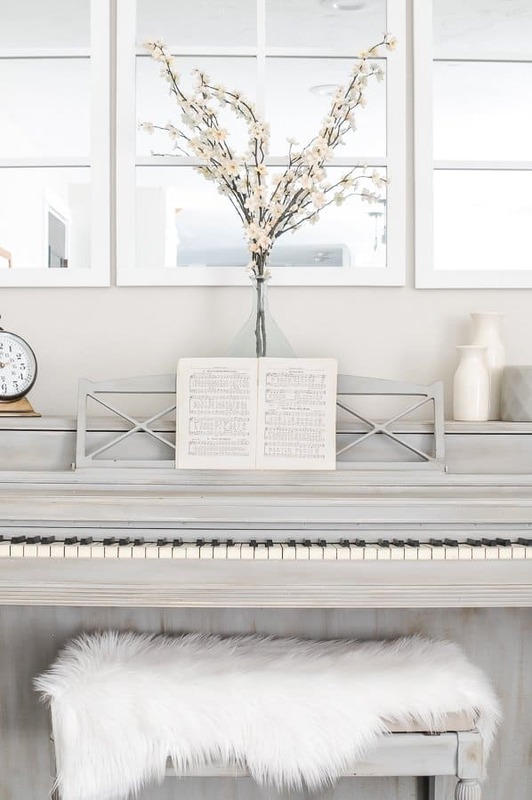 I kept the piano decor simple with a clock, blue glass jar with peach blossom stems and a trio of milk jars and a candle! 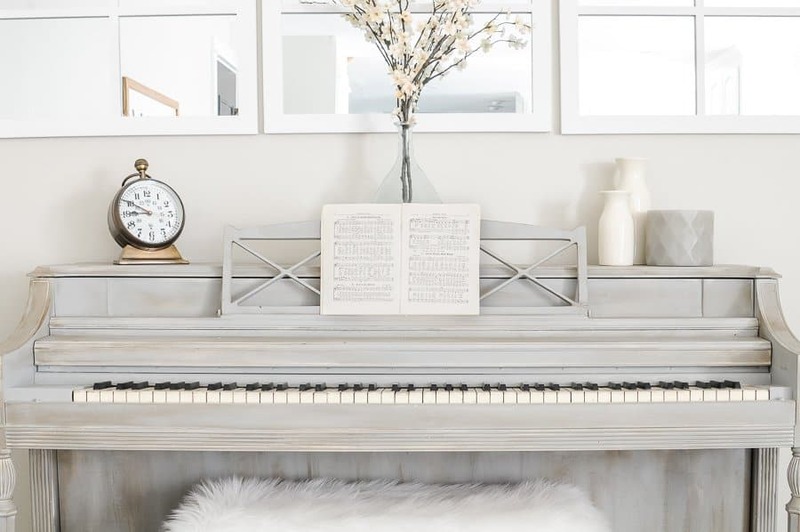 The blue glass jar on the piano matches the small square one on the mantel and ties the two spaces together. I also really love floral stems that stand tall in front of a mirror! So, what do you think of our spring living room? 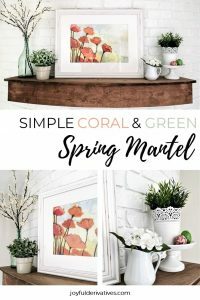 Based on my spring living room, here are some decor ideas you can try in your house to add some cheerful and bright decor this season! 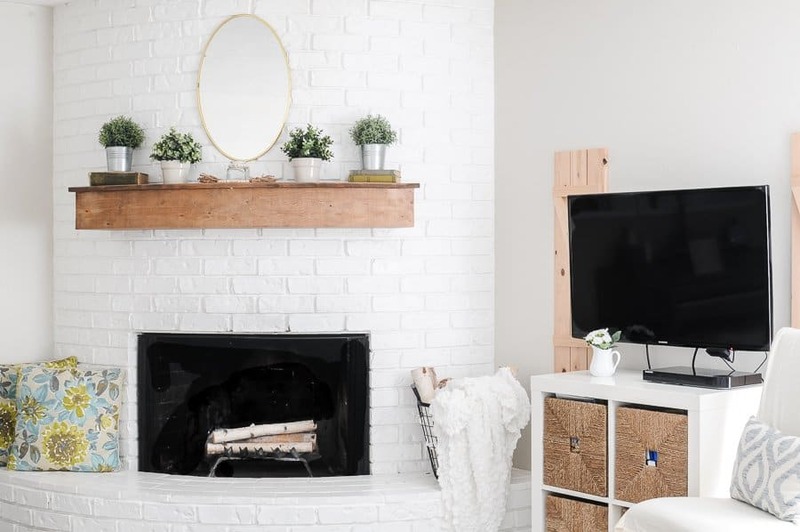 I hope you enjoyed touring our modern farmhouse spring living room and that you found some inspiration for decorating your home this spring! Thank you so much for stopping by my home! Have a wonderful spring! « How to Create a Kid’s Reading Nook out of a Closet!